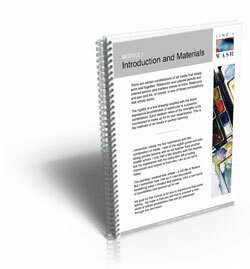 Description: An introduction to "Line and Wash" and a look at the materials that will be used throughout the course. This is simply beautiful. I love the feel of the video, the lovely appropriate music, the nifty camera work during your reminiscing, and your relaxed demeanor. I also really like the intro thingy with the pen drawing the line and the title. This is a lovely style. I may even try to do this line and wash stuff. LOL! Not now, though. I am working on the oil painting course. 🙂 Good job! I love the quality of the video, this course looks great so far. I have the Koi watercolor field kit (24 color) which I will be using. I have a comment about the Cotman tube watercolors. I was told by another artist to stay far away from Cotman, he recommended I should use the Winsor & Newton Artist quality. In terms of price, the Cotman aren’t that much cheaper anyway, only a few dollars per tube difference. I’ve also read articles that say to stay away from any student grade watercolor like Cotman. The thing about art supplies is that everyone has an opinion. Some folks are very passionate about those opinions. I will never tell you to stay far away from any product. The truth is that some products work better for some people while others don’t. You have to find what works best for you. I’ve tried to steer away from suggesting specific products in past courses. This has lead to a slew of questions regarding what brands I suggest. This time, I decided to go ahead and make a suggestion. I have personally found that I like the behavior and price of the Cotman watercolors. Not everyone will agree and that’s the way it should be. We have many different brands to choose from and there’s a brand out there that will fit with everyone’s style and personal approach. I’ll be using Cotman watercolors for this course simply because I like them. Some people don’t like them. I also like Prismacolor colored pencils. Some people absolutely hate them. You are absolutely free to use whatever brand you wish. Just use what works best for you. I have several books from well known watercolor artists. Despite Cotman rated as Student grade, they all recommend this brand. I bought the 24 half pan set and glad you are using them. This set doesn’t have Prussian but I have the color in a tube set I purchased. Based on reviews on Amazon, I decided to try tubes from Shinhan. They are listed as artist quality and have lightfast ratings, etc. The colors are incredible. And affordable for us newbies. I’m new to all mediums and recently, my back injuries have worsened to the point I can’t work any more. However, my brain is non-stop. Your courses are a godsend to me. I’ve written technical manuals, etc so I realize the hard work you put into all of your teachings. I’m so grateful that you are sharing such vast knowledge at an incredible bargain. Your passion shows, and whenever I see you on YouTube, I take the opportunity to recommend your site. I’m continually impressed at how much you work to add more content. Obviously you spend a lot of time each week. And writing PDFs for each module of your courses is very time consuming. Especially considering the amount of content you provide. You could easily have just provided the videos which is all that would be expected. You go well above and beyond. I thought a long time before I decided to subscribe to an online site. I’m happy I chose the Virtual Instructor. One quick comment I’d like for you to consider: For your live sessions, it would be helpful to have more specifics on the materials at the beginning. For example, the Prismacolor markers are expensive but I’d like to have the colors you use. Can you list the colors in the beginning? I just purchased a 24 set that included free brush tip markers on Sale for less than $45 at Jerrysartarama. That site is wonderful for art supplies. Thanks for all you do. I’m a huge fan and will continue to recommend your site. I’ve learned so much already! And always excited to see new content. Hi Matt! Linda again. I managed to start download. Wasn’t downloading for some time and did not follow all necessary steps. Sorry for false alarm, no need to respond. All of Matt’s Classes are excellent and continue to inspire me to explore other mediums. I would like to give newbies to watercolor a heads up. As Matt says,there are many outstanding brands of watercolor available in western nations. For those living elsewhere the internet is a wonderful resource. Artist quality watercolor brands are pricey for a reason. But beginners may not want to invest at first. Here’s the heads up. “Most,” student grade paint by recognized western companies give you an excellent return for beginners. Off brands include far too many “fillers vs pigment” ratio issues. Buy Cotman, Van Gogh, Sennelier La Petitte, and you can expect them to handle much like artist grade. You can achieve results without fighting with the materials you use. As a beginner you need practice and products designed for your success. Poor quality products make learning and creating art more difficult and often causes problems…..for everyone including master artists. Stick with brands that work with you until you know what you are doing. When you have achieved a sense of what works, move up to artist grades. Many people don’t know about DaVinci artists quality paint. It’s out of California. These are some of the finest artists quality paints available today. They are about to release a new size of 8 ml. AQ tubes very inexpensively priced, later this month. You won’t find better paint at any price. Make your money stretch when you can, like here. But never, ever, skimp on watercolor paper. That is the biggest determining factor in a painting. You can always find a way to accomplish lightfast issues. Painting on poor quality paper is always a problem in watercolor. I have paintings that were done years ago that are discoloring despite professional framing because I painted them on paper that wasn’t 100% cotton rag. I didn’t know any better and others didn’t want to discourage me. Now I have pieces that I was truly proud of which are disappearing in front of my eyes as the paper yellows from the acid content. Fortunately the only paint I could get at the time was artist grade. Just some info to help you make decisions and save you money and help avoid disappointment. Your skill may be just fine but if you are using inferior products it may not look that way at all. Hopefully this will help.